I wasted 3 discs (Magic, Made in Taiwan, DVD+R DL, 8.5 GB) trying the same thing. My DVD writer is LG GH22NP20 with IDE connection type. I updated its firmware from 1.04 to 2.00 but no success in burning again. Then my cousin brought his LG (an older model) which, he claims, was successful in writing DL discs with the same brand (Magic). I plugged off my LG and plugged the older one in, and tried to burn the image again. It also gave an I/O Error even without standing till 7%. I tried another burning program (CloneCD), but failed again. I've burned lots of 4.7 GB DVD+Rs and DVD-Rs successfully, even without a single error, with this LG DVD writer, but this case is very bothering for me. What should I do? Should I buy a new DVD writer other than LG? 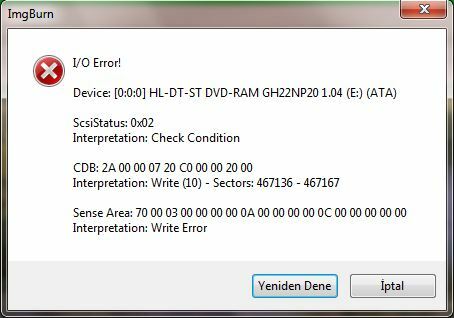 Could this be related to Windows or my hardware configuration? Thanks for your help. Edit: My burner works on my cousin's machine. So the problem must be related to my system. What could be the reason? Bottom Line: I've sold this PC and probably never gonna learn the answer to my question. It could be an issue with the drive controller it is plugged into, or it could be an issue with Windows. Did your cousin use Windows 7 to burn DL discs? Also, have you tried your burner in your cousin's computer? Reinstalling Windows may help, but there is no way to know until you try. Not the answer you're looking for? Browse other questions tagged windows-7 burning iso-image imgburn or ask your own question. the more DVDs at the same time , the slower the burning!